Landtech Soils are happy to announce a landscaping service that we are now offering for property that requires septic tank maintenance. According to the Irish Times, up to 79% of septic tanks are failing the local authority inspections across the country for the new water services act regulations introduced by the government in 2012. The implications of your septic tank failing an inspection will unfortunately require maintenance to be carried out, normally this work is done by large machinery and can cause the land around the area to be severely disturbed especially when a new percolation system is required. Our expert landscaping teams have the experience and technology available in order to transform this site into a safe and beautiful garden that can be enjoyed by the family again in a very short period of time. We achieve this by using our high quality turf grass, this quality grass is ready to roll out and is laid down onto our specifically developed soil created by us here, at our headquarters in Nenagh, North Tipperary. 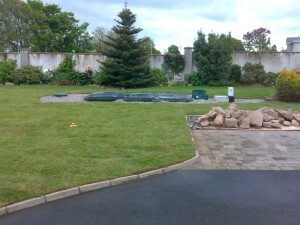 We can also lift the existing grass sod and relay it at your request. For each choice the result is an instant garden of the highest quality. We can guarantee you our objective is to create the garden that you always wanted while aiming to exceed even your expectations. We provide this service to private and corporate properties in North and South Tipperary, Nenagh, Portumna, Birr, Roscrea, Templemore, also in the counties of Dublin, Limerick, Cork, Wexford, Waterford, Kilkenny, Galway, Wicklow and to every city and county in Ireland.